In an article posted on their website featured EDEALO.com and all over social media and we are thankful for the lovely introduction. 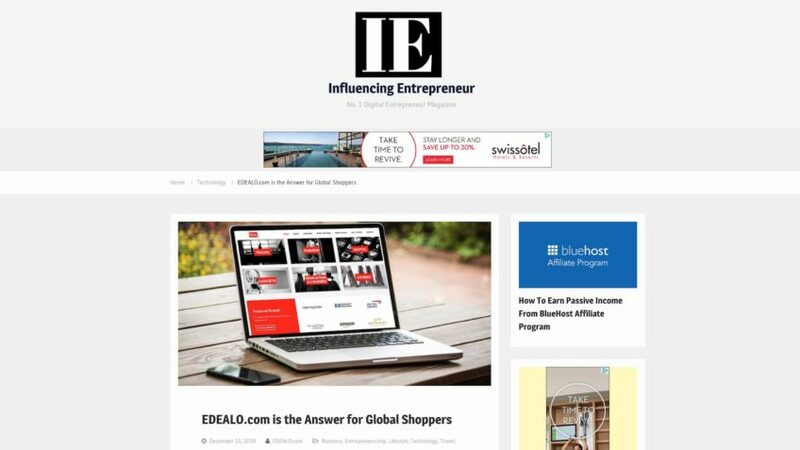 EDEALO.com is the newest publisher of online deals & coupons from 850+ global brands. Based in the middle east. It is the first and only website in the Middle East that publishes online offers and deals from ALL OVER THE WORLD from such a large number of brands. It’s a global directory for online shoppers and bookers who wants to save money when purchasing online products/services including Travel, Fashion, Education, Electronics, and many more sections. Unlike many savings websites, EDEALO.com is not focused on petty coupons. The website is especially designed for users who want a luxury lifestyle, but want to save money doing so. That is the reason you will likely find savings involving medium-to-high ticket items, that are mostly-unaddressed by other websites e.g. designer fashion, business class tickets, premium electronics. Also, EDEALO.com addresses global citizens, and isn’t limited in its offers to geographic boundaries. Subscribe to the EDEALO.com newsletter, or website push notifications, and EDEALO team will make sure you never miss out on a hot offer ever again. If you are not a big fan of newsletters or push notifications, follow EDEALO.com on your favorite social media platform and stay updated with the latest deals and offers. Another unique service about EDEALO.com is that it is 100% FREE to use its online deals, offers, and coupons. Unlike other websites, the visitors of EDEALO.com aren’t required to purchase, subscribe or even get cashback on your shopping. Just search for the code and use it! EDEALO.com also has a Facebook Messenger bot a.k.a. the Personal Deal Finder service. Just like the website, using this service is entirely FREE – all you have to do is go to EDEALO’s Facebook Messenger and let it find you the Deal that best fits YOUR needs. The Personal Deal Finder Service is partially automated via a bot, and partially manual via EDEALO’s representatives. The bot guides you through the Deals, and you have the option of chatting with an EDEALO representative for inquiries that aren’t covered by the automated bot. Read about it at EDEALO.com is the Answer for Global Shoppers post.